where R – radius of sphere, π – constant, that equals 3.1415. 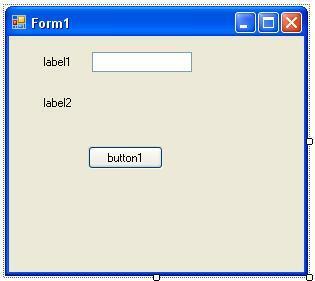 TextBox – text box, that used for input of value R.
A detailed example of Windows Forms Application development is described here. Save the project. the control of TextBox type (input string). Automatically, four objects with names “label1“, “label2“, “button1“, “textBox1” will be created. By these names we will be able to access properties of these objects. Program’s form will have the following view (Figure 2). Select the label1 control. In the Toolbox palette change the Text property – enter “R = “. Similarly, change the Text property for the label2 control (Fig. 3). 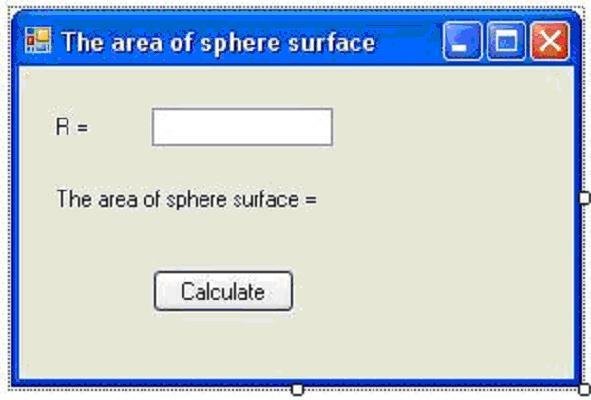 Input text “The area of sphere surface = “. Similarly to label1 control (object) we select button1 control. In the “Text” property enter string “Calculate“. Change the title of form. To do this we select the form. In the “Text” property of form we type text “The area of sphere surface = “. After editing, the form view will be following (Fig. 4). 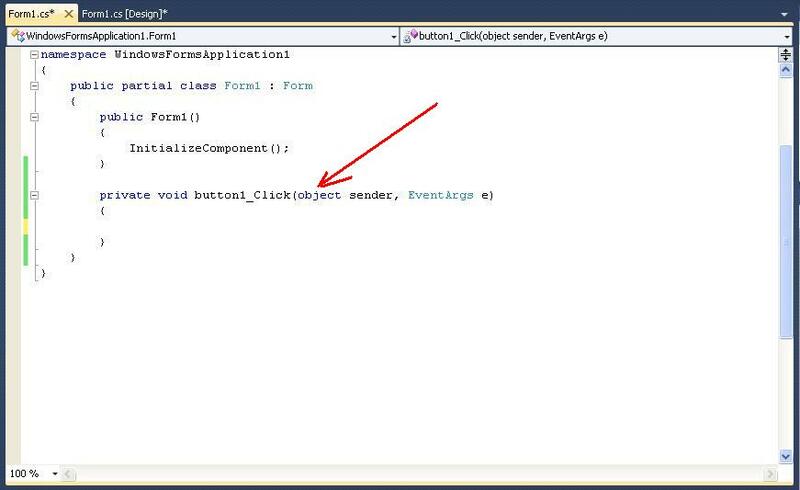 In our program we need to handle the event, which is generated when user clicks on the button “Calculate“. After clicking on button “Calculate” the snippet of program code will be formed. This code will be processed by our application. In time of handling, first of all, the value of radius R is defined. After that, we do the calculation by formula and we do output of result. do the double click by “mouse” in field of “Click” event (fig. 5 – 3). 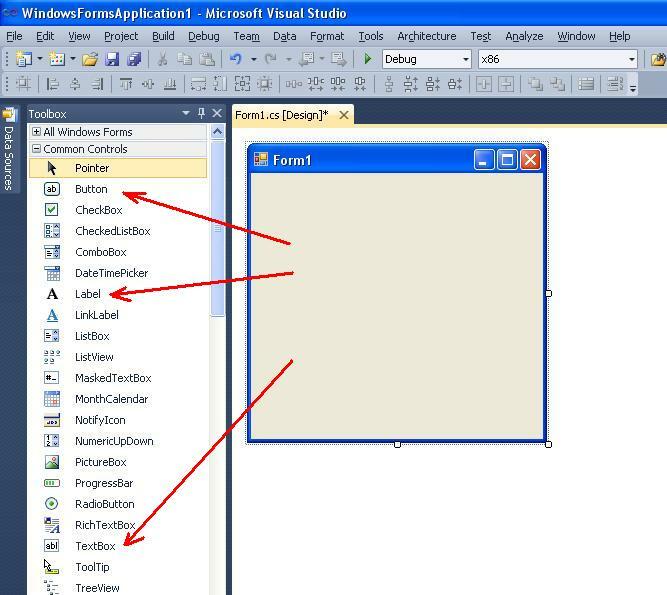 As a result the tab of program code, which is placed in to file “Form1.cs“, will be opened (Fig. 6). Two variables R and S of double type are defined in this code. Also, the constant Pi is described. To converting from text type “string” to “double” type, is used the “Parse” method. So the value of variable R is filled. The result of calculating of area of sphere surface is displayed in label2.Text property. Converting to “string” type is realized with the help of ToString() method. allows program to intercept a critical situation, which can be generated as a result of incorrect input to the “textBox1” field (for example “abcdefg“). will be displayed in ex.Message property. After that you can run our program and test it operation at any value of R.